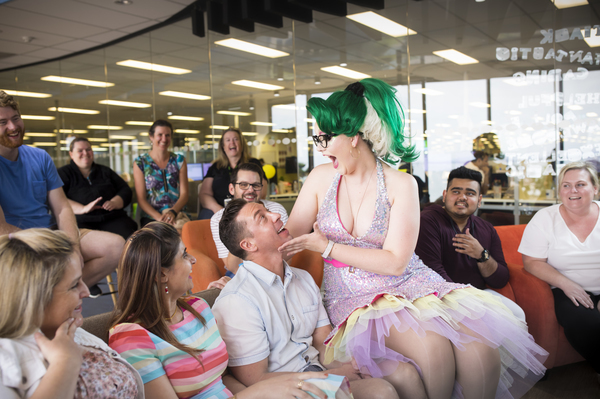 SNEAK PREVIEW: Rainbow Festival performer Bella Nitrate, the Faux Queen, entertains Anatole Horpinitch and other Energy Australia staff at Geelong. More than 50 employees, family and friends will support the Geelong Pride March on Sunday. Geelong’s Rainbow Festival has kicked off with ballroom dancing and salsa lessons before culminating in an inaugural Geelong Pride March through the CBD on Sunday morning. Barwon Health will host a free health forum as part of the festival today from at St Mary’s Library and Research Centre from 2pm-4pm. Topics will include inclusive health services in the Barwon region and local projects to support the health pathways of the LGTBIQ community.Geelong Rainbow Inc has invited Commissioner of Gender and Sexuality, Ro Allen to officially open the Geelong Rainbow Festival 2019 at the Piano Bar tonight. The event features drag shows and entertainment, followed by Saturday brunch at Cafe Bear and Scoobs on Sunday, a Queer film screening at the Pivotonian cinema in the afternoon and Super Queer as Dance Party from 7pm at The Deck Geelong. The morning march is a free event and organisers say everyone is welcome to wear something colourful and join in solidarity. Groups and companies need to register but individuals can simply join in on the day. Marshalling starts at 10.30am in the park and the march starts at 11.30am. Marchers will return to Johnstone Park for the Geelong Rainbow Festival Fair Day, with four hours of entertainment starting at 1pm. This family-friendly event will have live performances, queer kids book readings by the authors, games, face painting and other activities. For more information, visit the Geelong Rainbow Festival Facebook page.